Eclipse fever had been raging for months in my area of the county. The totality would be directly over my home. But I had already made plans in the spring to go to Nashville to see a longer totality and besides I was happy to plan a bit of a girlfriends road trip. We had booked hotel rooms in the perfect location, across the street from Centennial Park in downtown Nashville. Val, Becky, Tracy and I unpacked the car and put all the eclipse party necessities on the luggage cart; blankets, chairs, water, snacks and eclipse glasses. This was going to be an all day event and we wanted to be prepared. 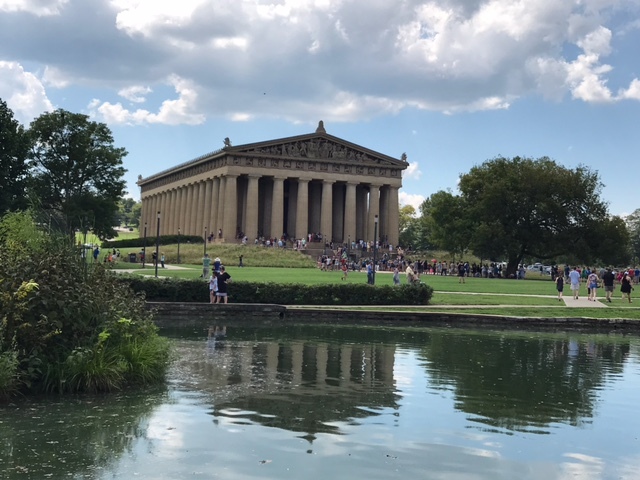 Nashville has a special place in my heart because it is my hometown and I have spent many a happy hour in Centennial Park the home of the Parthenon and now the great goddess, Athena, all 42 feet of gilded glory. 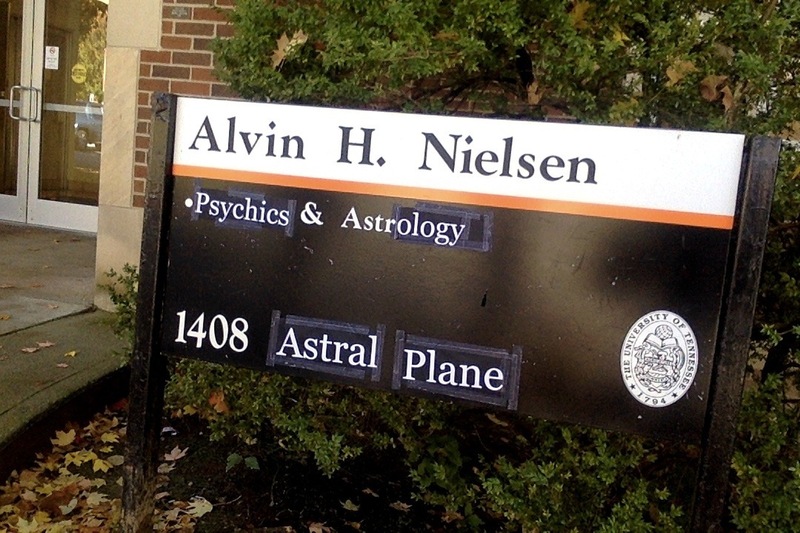 I couldn’t think of a better place to be for the grandest of astronomical events. Eleanor, Hannah and Sandy joined us bringing eclipse donuts from Krispy Kreme to add to the festivities. The seven of us headed across the street in the late morning and found a lovely tree that was perfect for our little party. We circled our chairs and got out the special glasses and watched the slow stream of people joining us on the expansive lawn in front of the home of the goddess. As we waited Tracy brought out a dozen or so stones and crystals that she felt were meaningful for the day and I arranged them on an old blanket in the center of the chair circle. 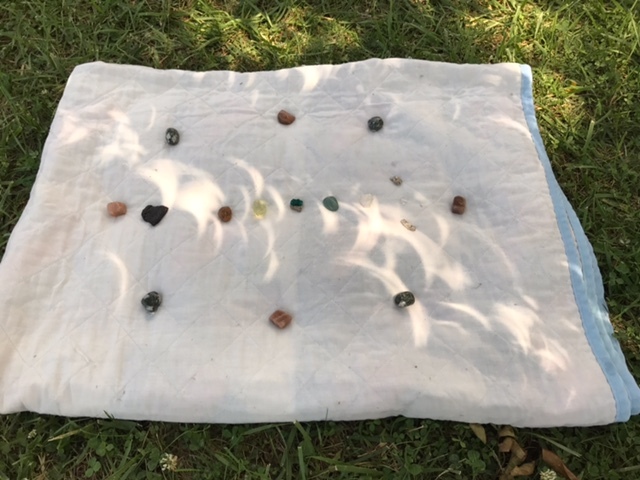 Several of the stones were aligned to specific chakras so I placed them in the appropriate order and circled them with other stones as an impromptu altar. We enjoyed the cool breeze and visiting, taking turns standing out in the cookie-bite sun to watch the progress. As the time of the totality approached, greater crowds from the nearby hospital and office buildings filled the lawn and about 10,000 eager amateur astronomers awaited the big moment. It was spectacular as the world darkened, the cicadas started buzzing and then the flash as the sun was dark and the magnificent corona was revealed. The crowed gasped and cheered and I tried just to take in that instant of pure magic. In that moment the world stopped. All too soon it was over and the light dawned again as quickly as it had faded and the crowds swiftly returned to their appointed destinations. It was amazing to me how just the littlest sliver of sun brought back total daylight. I felt it was my job to make sure that the moon totally moved off the sun and that the cycle was complete so I stayed on under the tree and would periodically check that the heavens were still in their proper motion. It was in this time of quiet; after all the anticipation had past, my favorite moment began. 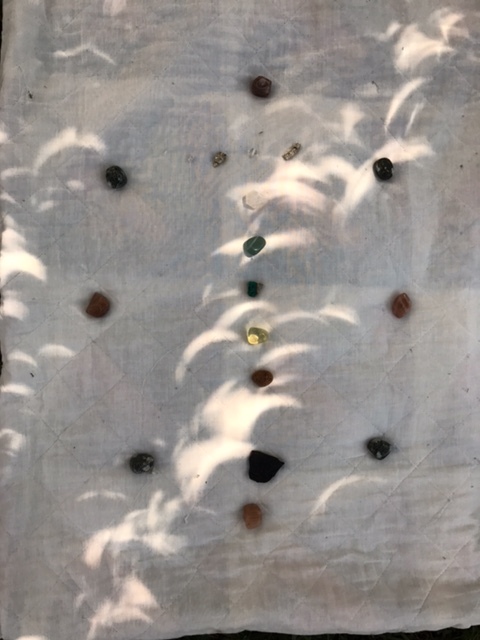 As the our group of friends sat around the little altar of stones the crescent shaped sun/moon shadows started to move across the blanket slowly and gently lighting each chakra stone in order from the base to the crown. Each stone had a few moments to shine in the sun before the next stone was illuminated, then the next and then the next. The little waning moon shapes danced across the stones several times over the next hour as we talked about our experience. When the last traces of moon had left the sun, Tracy said a beautiful prayer of thanks and we gathered the stones and chairs and headed back across the street. By then there was just a handful of people left in the park. 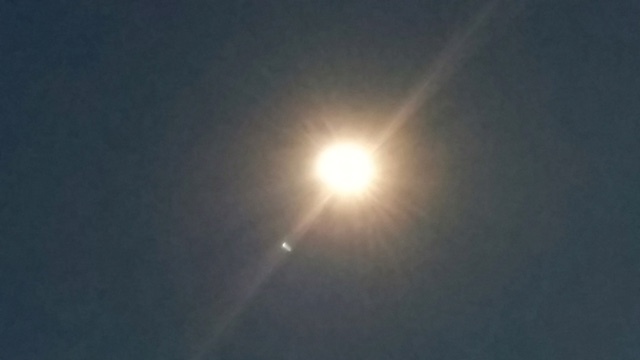 I was so glad I had stayed to the end for the eclipse wasn’t just about those few exciting moments of totality but about the entire eclipse from the first nibble of the moon to the final moment when the sun was full again. It was about the waxing and the waning of the eclipse, the entire experience. It is easy to just want the fun, exciting moments of life but all the parts of the experience are important. I found the greatest blessing of the day came with the quiet moments when everyone thought the show was over but yet the magic wasn’t finished if you took time to look. All of life is important, every part of our time of earth is part of the magnificent journey of our soul. This last year I’ve talked a lot about my daughter Alexandra and our adventures in Spain but I’ve not said much about my precious Caroline. So the other day she sent me this picture of her Halloween prank on the Physics building, I decided it is her moment to shine. How I got a child like Caroline I will never know, she doesn’t just march to the beat of a different drummer, she circles an entirely different solar system than the rest of us. Every day she does or thinks something that the rest of us couldn’t even imagine. I’ve spent her life setting big boundaries so that she could be her creative self without falling off the earth. As a little girl she was adorable, blonde and blue-eyed with rosy cheeks and such a vivid imagination that she was five before she stopped being a cat named Sally most of the time. She didn’t have an imaginary friend, she was an imaginary friend. She would use two combs as her pretend violin until I got her a real violin at four and began the all consuming world of Suzuki violin. The violin was her special place where her uniqueness could shine and be recognized by her peers. By the fourth time through any piece she had it memorized including all her orchestra music. My girls loved to perform and the “fiddlin’ Bowen sisters” went on the road for any and all occasions. 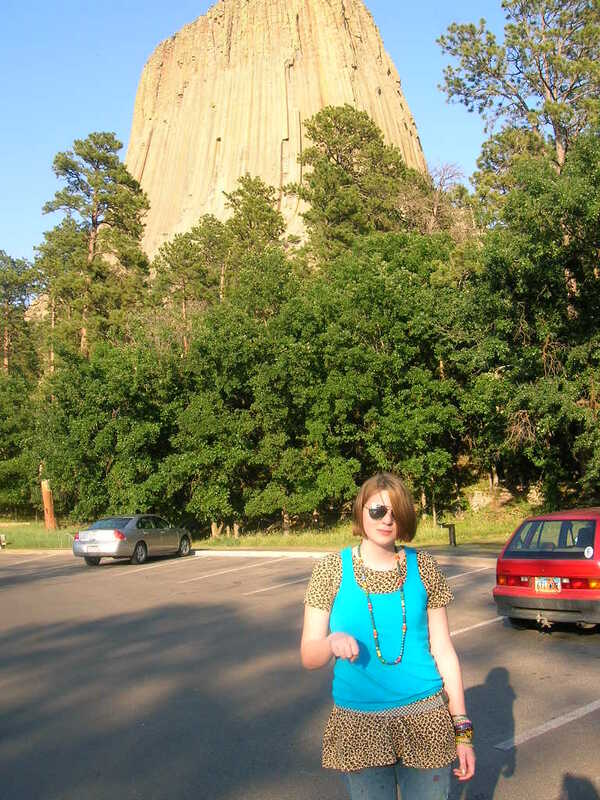 Caroline at 16 trying to have a “Close Encounter of the Third Kind” at Devil’s Tower Wyoming. I think it was in 1995 that I first became aware of the Tarot. A friend suggested that the High Priestess archetype was waking up in me. I had no idea what that meant so I went searching and somehow had a vague idea that it had something to do with the Tarot. All I knew was the Tarot was part of the forbidden world of “the Devil’s workshop” bringing eternal damnation to those who use it. I worked through my fears of a fiery inferno and bought a book called Living the Tarot by Amber Jayanti. I devoured the book and still use it as a treasured reference. No longer afraid for my eternal soul, I realized the healing and wisdom of the High Priestess and never looked back. 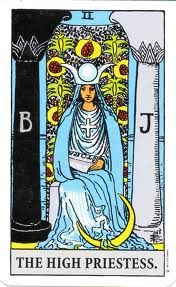 The High Priestess is the lunar goddess with the waxing, full and waning moon as her crown. She has the crescent moon at her feet showing her receptiveness to the subconscious. The moon holds the power of the tides, and this quiet and gentle goddess holds the power of the subconscious. Her beautiful blue dress becomes the river flowing to the ocean of the unconscious, the Divine Mind where we originate. It is in silence that we access the subconscious, the place where the Great Mysteries lie dormant until we realize that our busy and noisy lives keep us from entering the inner worlds. These mysteries, the Wisdom of the Ages, are accessed between the two pillars, Boaz and Jachin, the entrance to Solomon’s Temple. Our goddess holds the Torah, the book of law, the Akashic Record where knowledge and experiences are recorded; she doesn’t have to look at this book because she has a perfect memory. She holds the key to memory which is to sit quietly and let the remembrance of the eternal rise to the surface. We use the Tarot as a system for recall; the 22 pictures of the Major Arcana go directly to our subconscious to help us remember the wisdom in the soul’s journey. When we remember we recreate like Isis “remembering” Osiris back to life. The High Priestess is Isis, Sophia, the Virgin Mary, beautiful, pure, quiet wisdom. Call on the High Priestess to help you break subconscious patterning, cope with painful memories, worrisome situations or to become more neutral and therefore receptive. As you mature you will move from being controlled by unconscious behaviors to tapping into the world of the subconscious through mediation, self-reflection and deep silence. Like the drop of rain, flowing to the ocean. I’m definitely a minimalist, I like white walls and empty spaces, kind of an early-Convent look. On the other hand, my In-Laws, after great childhood deprivations, were maximalists preferring a high grand Baroque style with lots of mahogany and silk. 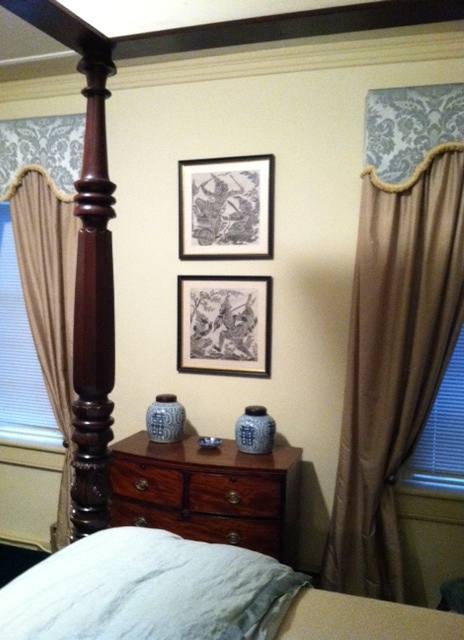 So when I was redecorating I moved their large, ornate furniture and silk drapes to Hamilton’s childhood bedroom, I figured I could change a few things after 45 years. Since we call Princess Alexandra’s pink floral room the Princess room, I started calling the lavish Asian inspired bedroom the Empress room. Queen Caroline loves to sleep there when she is home. She says it makes her feel fancy. Our guest either can’t wait to sleep like royalty in a bed so tall it requires steps or are terrified of falling out of bed in the middle of the night. I’m sure the Empress in the Tarot would be totally at home in this room, she loves lavish. The Empress card is about abundance and beauty. She sits on her lavish throne complete with silk cushions. She has a long beautifully embroidered robe and a spectacular crown of stars As the mother archetype she embodies the beauty of Venus, the harvest of Ceres, the devotion of Demeter, the unconditional love of The Madonna and the compassion of Quan Yin. 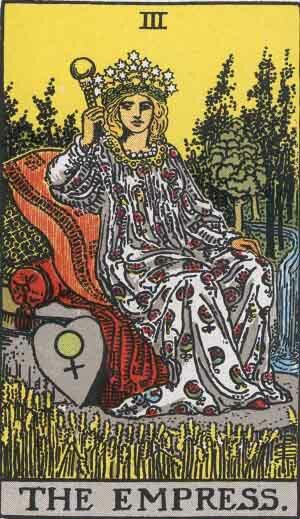 The Empress sits in her Earthly garden surrounded by the fruits of her work in the material world. She joins the spiritual and the material world taking action rather than just holding it in her mind. The Empress is so abundant and good at manifesting that the Emperor sometimes needs to rein her in, he checks her credit card statements and closets and lets her know when she has plenty. She loves to nurture and wants everyone to be safe and warm with plenty of cookies and milk. What do you want to manifest or nurture in yourself? She is Mother Nature and her color is green. Her number is 3, the triangle, the first geometric shape making the material world and movement. The Empress says take action and plant your garden. Use your imagination to make your life abundant and joyful. Then go show her when you’re done and she will make you tea and scones. She is the Native-American corn goddess Selu and asks “Does your spirituality grow corn?” Do you take what you have learned and put it to action and live with love and compassion or is it just ideas that don’t make you happier and just annoy those around you? When the Empress is fully developed she is the very compassionate and wise mother. When she is less developed she is the Dark Mother, Kali, perfectionistic, enabling, controlling, demanding or even cruel. What relationship do you have with your own mother? Do you need to forgive or ask for forgiveness? Invite the Empress into your life and embrace your abundance on all levels, mental, physical, emotional and spiritual. Use your imagination to see that abundance is more than a fat bank account but a way of experiencing the world. Have something lavish in your life, a silk pillow, a walk in the woods, bowl of cherries, kitten/puppy snuggles or hot bubble bath. The Empress brings joy and love to your life so you can give joy and nurture everyone around you. Five years ago today I stood face to face with the mighty Egyptian goddess Sekhmet. It is quite a story and I think I’m finally ready to tell it. This weekend is the third anniversary of the Egyptian Revolution and it was Sekhmet that got me a front row seat. So let’s start with Sekhmet’s story. The people of the Earth were acting up so the sun god Ra sent the lionheaded goddess Sekhmet to get everyone back in line. Sekhmet got a little out of hand killing way too many people and so Ra had to figure out a way to stop her. He laced some beer with drugs and red food coloring then poured it on the ground. 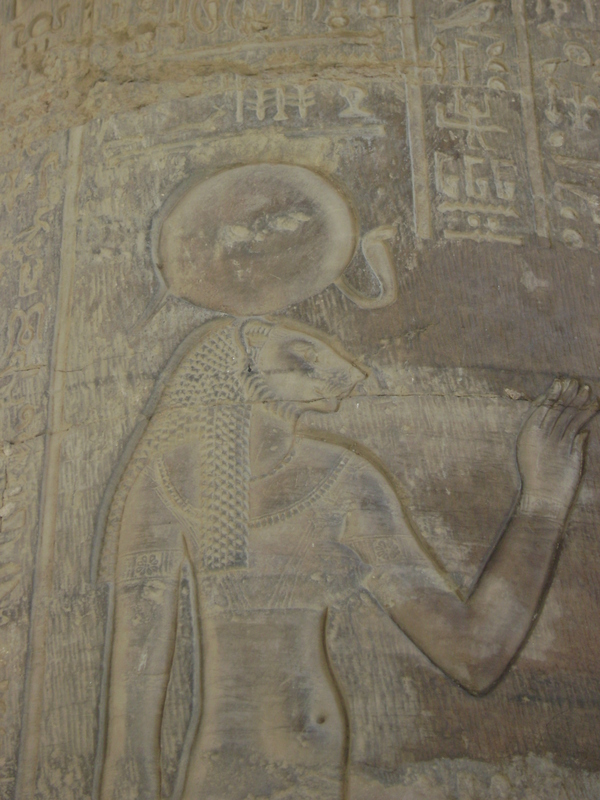 Sekhmet, thinking it was blood, drank the potion and finally stopped her rampage. She retains her reputation for power and revenge. Yikes!! I was getting ready to go to Egypt for the first time when my teacher Page Bryant came to me with an assignment. “Every full and new moon between 7 and 9 pm, find a quiet place and light a candle and tune into the energy of Sekhmet.” My first reaction was “Aaaahhhhh, Sekhmet is mean. Can’t I have a nice goddess like Hathor or Isis?” But when Page tells me to do something, I always listen and so for six months I worked on my assignment. Sometimes I felt her energy and sometimes it was just a nice quiet time, but I did it faithfully. The month before the trip I decided to look at the moon stages during my time in Egypt. A new moon and solar eclipse fell on the day we were going to Sekhmet’s chapel at Karnak Temple. I knew something was up. This was no accident. By the time I made it to Karnak Temple in Luxor, it had already been a very intense trip and I had been to five temples. I was definitely on energetic overload so what was one more. 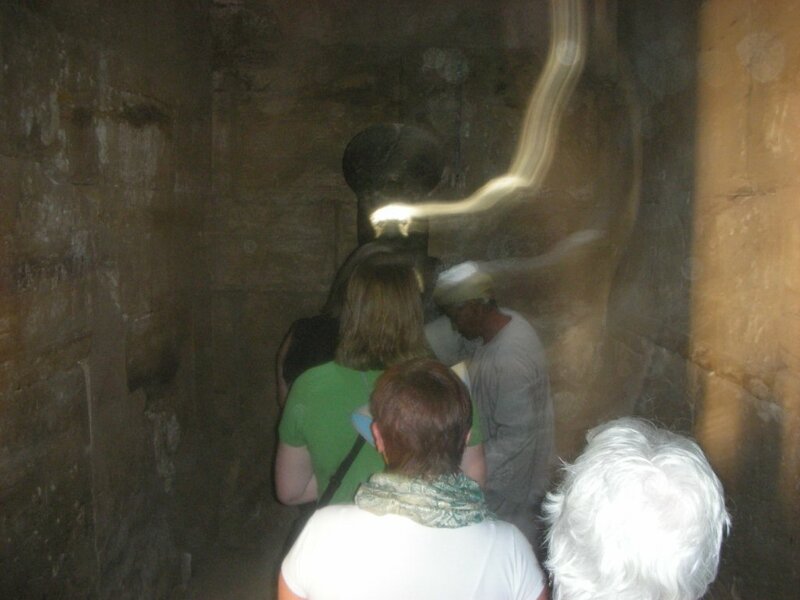 The group went straight to Sekhmet’s chapel which is off to the side of the complex and out of the main stream of visitors. This tiny chapel has held the principle Sekhmet statue for 3500 years. There are hundreds of statues of Sekhmet around the world but this one is the seat of her power. I was the last of the group to get into the small, dimly lit room. There she was, I couldn’t touch her I was in such a stunned state. I laid a few flowers, a small stone and oil at her feet as an offering and I just stood back to take it all in. Toward the end of my visit her Egyptian guardian started to take the energy from her and place it on those of us who wanted it. So that is me in the green shirt waiting to receive her energy. That night I saw the pictures. They were stunning proof the energies we give names and personalities are really there. There have been claims on the internet that those pictures were taken because of a device running in the chapel but that is not true. The picture is because of the devotion of those who love and honor the goddess in all her many forms. I know because I was there. I call on Sekhmet often when I need courage and protection and help, I know she will be there. I also know that she has a gentle and loving side protecting those who love the goddess. I’m reminded of her when my sweet cat Persy climbs in my lap for love. I’ve seen many of her statues and I always want to hold her hand and thank her. On Thanksgiving weekend in 2010 some friends came to town and brought me a gift, a giant calendar of pictures of Tutankhamen’s treasures. 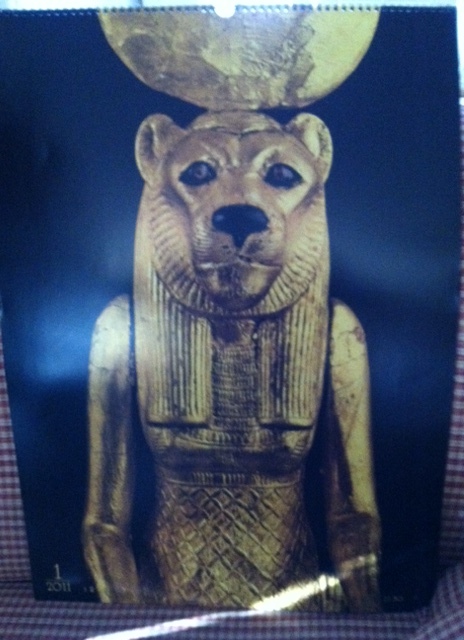 January’s picture was of my dear friend Sekhmet, three feet tall and of bright gold. This calendar was from Germany and not even available in the US but she had found a way to make her presence very clear to me. I was on the fence about going to Egypt for a third time but, when she showed up in such a unique way, how I could say no. Six weeks later I was in Egypt when the Revolution broke out. I was never afraid because I knew I had Sekhmet on my side and she wanted me there. Thank goodness I listened. Before you decide that I’ve lost my mind and am an idol worshiper, try to see these stories as our limited minds trying to grasp the limitless universe. We use these archetypal gods and goddesses to make sense of these unseen worlds. They help us understand ourselves and our time on Earth. Whether we call on goddesses or saints or great deities, the Universe is always there to bring us miracles. During the early 1960’s my husband’s family spent several years in Bangkok Thailand as medical missionaries. Out of that experience came many exotic stories from a land far from Tennessee. One story is particularly legendary, the family was visiting a different exotic location and in the hotel lobby was a sign that said “Fresh Girls from Bangkok”. To use those words to describe the world’s oldest profession was definitely a new experience and so the story was told many times. Many years later as a birthday joke my friend Jane gave my father-in-law a cement lawn ornament of a “Fresh Girl from Bangkok”. 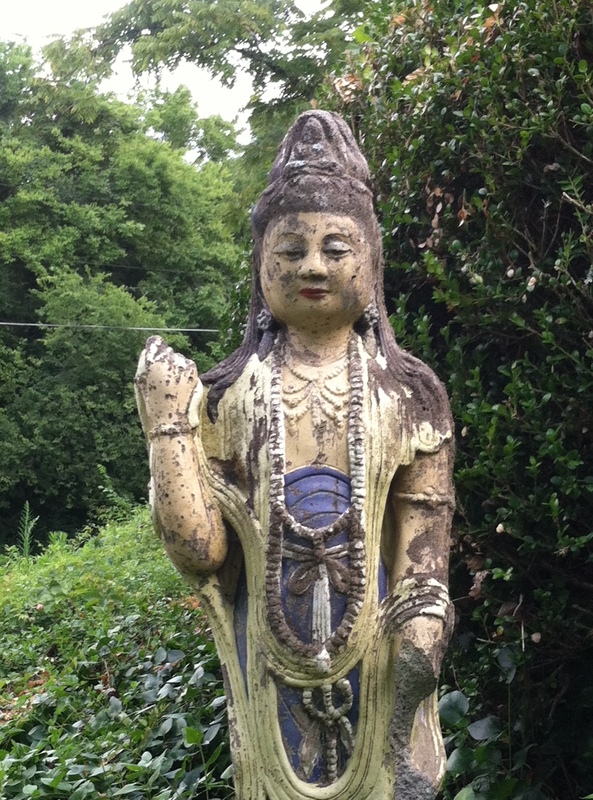 So the girl from Bangkok took up residence in the side yard and has been there for the last 25 years. A couple of months ago my friend Mary was visiting and saw “Fresh Girl” and said “I love your Quan Yin”. What? Quan Yin the goddess of compassion? I had long studied and loved Quan Yin and she had been on my personal altar for years but I was so indoctrinated in the family story that I never saw that the Goddess had been with me for so long. My very conservative Christian family had actually been protected by the Goddess all of those years and we only saw her as a prostitute. I now love Quan Yin more than ever for being there even when I couldn’t recognize her. Much like the false story of Mary Magdalene as a prostitute, the truth was hiding in plain sight. The Goddess was waiting patiently for me until I was finally ready to see her. She didn’t mind the heat and the cold or the name calling. Her job was to be there holding love and compassion on this special place. I look back on the events of the last three decades and see how slowly, slowly things were being set in place for this new phase of my life. I bless Quan Yin for her protection and guidance all those many years. The Goddess has been with me all along and I didn’t even realize it. Her reputation has been restored and she has an honored place in my garden and my heart.